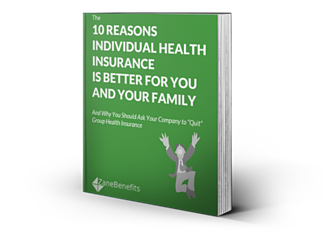 Zane Benefits, the leader in individual health insurance reimbursement for small businesses, announced today the publication of a new eBook, "The 10 Reasons Individual Health Insurance is Better for You and Your Family." The eBook helps employers understand the advantages of individual health insurance. According to Zane Benefits, individual health insurance coverage is almost always better and costs about half the price of comparable group coverage. Moreover, most American families earning less than $100,000 a year are eligible for a federal subsidy to pay for individual health insurance - but only if their employer does not offer group coverage. The amount of the subsidy depends on income and family size and pays monthly, on average, about half the price of individual coverage - making individual coverage after the subsidy about one-fourth the price of comparable group coverage. As a result, the market for individual insurance is expected to expand from 30 million insureds in 2012 to more than 150 million insureds by 2025. And as the market rapidly shifts to individual health insurance, employers are rapidly transitioning to employer-funded individual health insurance. Zane Benefits is the leader in individual health insurance reimbursement for small businesses. Since 2006, Zane Benefits has been on a mission to bring the benefits of individual health insurance to business owners and their employees. Zane Benefits' software helps businesses reimburse employees for individual health insurance plans for annual savings of 20 to 60 percent compared with traditional employer-provided health insurance. Zane Benefits' software was been featured on the front-page of The Wall Street Journal, the USA Today, and The New York Times. Learn more at www.zanebenefits.com.